Rome is about history, art, architecture, music, bright colors, spectacular views, intense flavors, vibrant city life and magnificent surroundings. As the capital of Italy, Rome, also known as the Eternal City, has captivated residents and visitors alike with a beauty and appeal that set it apart. Considered one of the world’s most beautiful cities, Rome provides breathtaking landscapes, unparalleled views and spellbinding glimpses of thousands of years of religion, history and culture. Since the dawn of time hundreds of writers, poets, singers and artists from every period and every part of the world have adopted it as their muse, celebrating its color, art and richly historical atmosphere. To this unending charm Rome marries a passionate and fun-loving spirit, which offers unbeatable and once-in-a-lifetime sensations for people of all ages. Rome is an unquestionably popular destination for those who choose to have their wedding in Italy. All those seeking an unforgettable and unique experience should hold their wedding in Rome. 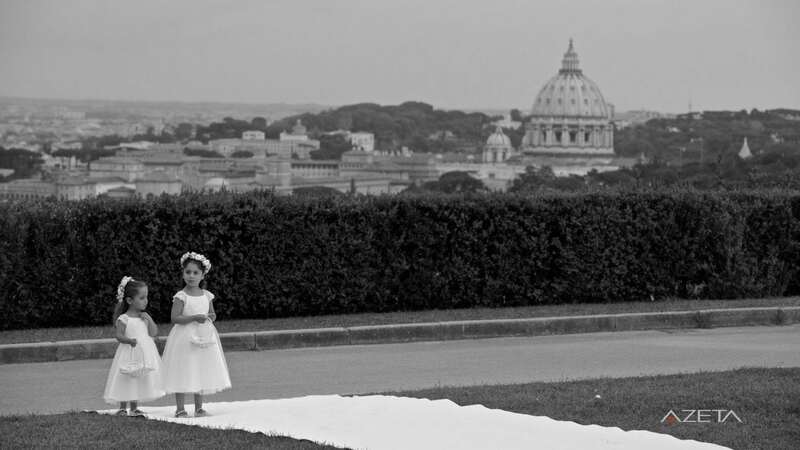 It is no coincidence that numerous celebrities have chosen to make their special day unforgettable with a wedding in Rome! Of the stars who have chosen Rome as the stage for their wedding, vast number of VIPs have flown in from abroad: way back in 2006, Tom Cruise and the stunning Katie Holmes crowned their dream of love on the battlements of an ancient castle, with an event in perfect medieval style. In 2010 the actress made famous by American Beauty, Mena Suvari, married Italian producer Simone Sestito in one of the Vatican’s private chapels, amid great secrecy and with a very limited guest list. The wedding of Rome’s celebrated No. 10 Francesco Totti to the show girl Ilary Blasi was equally famous, with over 400 guests invited. No less impressive were entrepreneur Flavio Briatore and TV star Elisabetta Gregoraci’s nuptials, whose highly exclusive party included around 350 guests. Way back in 1949, Tyrone Power and Linda Christian’s wedding in Rome went down in history: theirs was the first major Hollywood wedding to be held in Italy, at the Santa Francesca Romana Basilica. It proved to be a supremely stylish wedding, in perfect Hollywood style. Rome is an open-air museum characterized by grandiose locations that are warm and welcoming at the same time, which provide the perfect setting for capturing your perfect day on camera. And Rome’s particular magic always augurs well for eternal love. For an unforgettable day that will undoubtedly amaze everyone involved, choose a city that combines constant activity with hidden corners of paradise, offering the couple and their guests peace and privacy. Rome offers a range of choices that few other European capitals can rival: boutique hotels, villas with panoramic views, historic castles and roof gardens. Countless churches and locations for every kind of wedding in Rome will lend themselves perfectly to the personalities of every bride and groom. Furthermore, Italy is the undisputed home of traditional cooking, with exceptional and exquisite food to suit every taste. This added value underpins the wedding reception, where you guests will be astounded by the cuisine on offer, Italian gastronomy being one of the most well known and appreciated in the world. For all those couples who want to experience – and offer their guests – a perfect day, Rome provides the most superlative setting. From a practical point of view, Rome offers significant logistical advantages for those who decide to get married in the Eternal City. It is certainly the most convenient city for a: it has the greatest number of flights from abroad to any other Italian city; and once on the ground you will practically have arrived at your destination. Rome’s airports are very well connected and you can reach the city centre in about 30 minutes. Moreover, given how easy it is to get around, your guests will be free to visit Rome as they please. TYPES OF CEREMONIES AVAILABLE FOR YOUR WEDDING IN ROME? A civil ceremony for your wedding in Rome: A civil ceremony must be conducted in a town hall or other, specifically authorized venue. The ceremony lasts approximately 30 minutes and is performed by a local state official. Most town hall function rooms are located in historic buildings or large municipal villas, all of which provide a fantastic setting for your wedding celebrations in Rome. The ceremony can also be tailored to your personal taste with musical selections, personalized vows written by the bride and groom and readings chosen by the couple. By celebrating the entire event at the chosen venue – both the civil ceremony and the reception – everything will be even more easily customizable: the couple can select every detail based on their particular tastes and personalities. A religious ceremony for your wedding in Rome: Under Italian law, the ‘Concordat’ marriage is a canonical marriage transcribed by the State in order to recognize its civil implications. Both types of ceremony, whether civil or canonical, confer the same rights and responsibilities upon the married couple. A religious wedding, by virtue of the provisions of Concordat law, also has a civil value if, at the end of the religious service, the presiding priest reads several articles relating to the rights and responsibilities of the married couple from the Italian Civil Code, and the marriage act is inscribed in the civil register. Rome is full of majestic churches in which to hold unforgettable weddings. Other religious ceremonies for your wedding in Rome: In line with the provisions of the Italian Constitution, all religious denominations are equally free before the law and it is therefore possible to celebrate every kind of marriage (Jewish, Protestant, Muslim, Hindu, etc.). A symbolic ceremony for your wedding in Rome: A symbolic ceremony may be held in any venue of the couple’s choosing. It might be a place which has a special meaning for them, or with which they have an emotional connection, or simply somewhere that has caught their imagination: a garden or park; a terrace with a view over the sea; a castle or villa; a chalet in the mountains or a private home. As the marriage is not recognized by law, no specific documentation or certificates are required. The symbolic weddings organized by MY WED IN ITALY are specifically tailored to the wishes of every individual couple. WHERE WILL THE CEREMONY FOR YOUR WEDDING IN ROME TAKE PLACE? Rome offers varied and picturesque locations; you can stage your wedding in Rome in the city or by the sea, in the country, in the hills, by a lake – all of which are within a few kilometers of one another. For religious ceremonies there is a large number of churches to choose from: each one rich in art and history, like Rome itself. Small and discreet churches for intimate weddings and larger, majestic churches for weddings with more guests; ancient or more modern, plain or more ornate: every Roman church tells a story and offers itself to you in all its splendor to provide the setting for your wedding in Rome. Otherwise, for non-religious ceremonies you may choose any location in Rome based on your personal tastes and the signature style you would like to give your wedding in Italy. The Sala Azzurra (Blue Hall) at no.8, Piazza Regina Pacis. Majestic villas surrounded by closely tended parks, where the bride, groom and their guests can enjoy exclusive use of all areas. Terraces offering spectacular views over the Capital, perhaps in one of the sumptuous nineteenth-century buildings at the heart of the sites of Ancient Rome. Castles not far from the centre of Rome – the historic former residence of princes and Roman nobility – are the ideal location for those who dream of a fairytale wedding. Often enriched with historic fountains and natural caves, when they reveal all their magnificence these locations provide genuinely striking surroundings. Many celebrities have chosen this location to make their special day absolutely unique. Having your wedding in Rome will allow you to live a day of singular and unforgettable emotions, feeling like the lords and ladies of yesteryear. For those who want to bring together luxury and convenience, and spend all day in their chosen venue, Rome has so many splendid hotels in which celebrate unforgettable weddings. Frescoed halls, hidden gardens designed by major architects, five-star kitchens … There are so many dream locations in which the bride and groom can live their best day. WHAT IS THE BEST TIME OF YEAR FOR YOUR WEDDING IN ROME? Thanks to the mild, sunny climate of the Bel Paese – “the beautiful country”, as Italy is known – you can organize fairytale weddings in Rome at any time of the year. From spring to winter, Rome provides unique, striking landscapes that serve as the perfect backdrop to your wedding in Italy. In the spring, long days close with unforgettable sunsets, wrapped up in the scent of the wisteria in bloom. The whole city awakens in order to allow romantic walks: through narrow streets filled with artisans’ workshops, or down by the river as it reflects the city’s wealth of historical wonders, or through the gardens of breathtaking villas. The summer is hot and sunny, cooled later in the day by the typical evening breeze known as ponentino. The sea can also play a major role at a wedding, with the coastline’s countless beaches providing the backdrop for faithful promises of love. Even during the winter the temperature is mild: there are few very cold days, and these are largely confined to the months between December and February. At this time of year it is the ancient, historic buildings spread across the city centre – or the spellbinding castles just outside – which take centre stage. By trusting My Wed in Italy you won’t have to think of a thing: the entirety of your wedding in Rome will be organized down to the most minute detail, in line with your instructions. Every aspect will be planned well in advance, both for you and your hosts, if necessary. You will also have the option of guided tours of the city, so as not to miss out on the most beautiful parts of Rome; accompanied by a local guide, you will be sure of experiencing the full range of emotions the city has to offer.